Heavenly agents of the "Corps" fight against demonic Morlocks in Hollywood. Deacon Jones: I'd like to quote to you a passage from War and Peace. Violence in its many forms is an involuntary quest for identity, and when that identity is threatened, we have a mandate for war. War ladies and Gentlemen, that's what we're fighting. 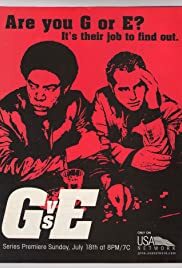 I am not usually a fan of this type of genre, but I have to say that "G vs E" is one of the most interesting shows I have seen in a long time. I'd go so far as to say it's better than "The X Files," which has really gone stale in recent years. I was actually interested in seeing the show after I learned Richard Brooks (Paul Robinette on "Law & Order") was one of the stars. Brooks (Henry McNeil) and Clayton Rohner (Chandler Smythe) seem to have chemistry that is seen only in the great "detective teams" - such as Joe Friday and his partner from "Dragnet", Lennie Briscoe and Mike Logan from "Law & Order, and so on and so forth. At first I thought there would be a lot of gratuitous and needless violence. But, after watching the first 2-3 episodes, I thought that wasn't the case. "G vs E" comes off as a cross between "The X Files" and "Touched By An Angel". It has it's moments where the lead characters almost make serious mistakes, but there seem to be some lighter sides (read: dark humor) to the show. The premise of the series gives a new twist to the battle between the "Good Guys" and the "Bad Guys." I like the fact that they set the show in Los Angeles, where the ironies of how evil the entertainment industry can be fly out at you. The only other "G vs E" character that really stands out is Deacon Jones (Narrator/Himself), who brings that toughness that made him famous in American professional football during the 1970's. Overall, I have a feeling that this will be another of the USA Cable Network's crown jewels in its programming. So far, after seeing the first four episodes, I have no reason to think otherwise.